While the world’s giants wage their battles in the international arena – first India vs. China over borders, now Google Vs. China over the internet – far up in the Himalayas, tiny Bhutan (with a population of 600,000) also took on China recently, albeit with no alternative other than quiet diplomacy and tact. On 14th January Bhutan wrapped up the 19th round of border talks with the People’s Republic of China. According to the talks the two governments will meet again to carry out a “joint field survey” of the disputed territories in the north, which comprise 4 areas amounting to a total of 874 sq km. But the Chinese Government’s actions on Bhutan’s northern borders have hardly been ‘cordial’ or ‘most friendly’. 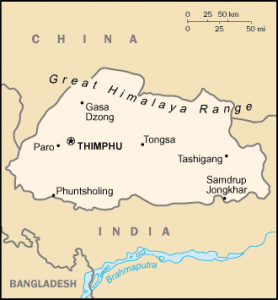 Between 2008 and 2009 several border intrusions by Chinese soldiers deep inside Bhutanese territory were reported. Not only that, the Chinese soldiers had also started constructing roads leading right into Bhutanese territory. It took several protests from the Bhutanese government's side and many discussions at the State level for the Chinese to stop the road constructions. It seems like the sentiment among Bhutanese officials when it comes to China is to tread carefully with the giant. After all, Bhutan is the last country that can afford to stir its ire. The official stand, therefore, has always been to say that the discussions were “meaningful, productive,” despite what happened. But just how friendly these neighbors are, is yet to be seen as the border issues remain unresolved and talks continue. Last year in March, when Canadian researchers uncovered a vast spy system that looted information from computers in 103 countries (including those of the Dalai Lama) Bhutan’s Foreign Ministry was also on that list.